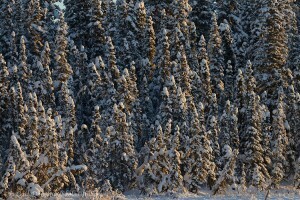 Spruce trees in Wrangell – St. Elias National Park and Preserve, Alaska. Please click on the image above to view a larger version of this photo. 2013. It’s a new year already. The days are getting longer, so I’m told. I’m another year older, slower, fatter and balder. But a new year can also mean a great time to focus on our work. Draw it into focus by outlining and giving voice to where we might like for it to go. Without that articulation, it’s easy to wander in circles, and not really move forward with our art. I’m reminded of a great line by my friend Craig Tanner, when he was asked what is the most important concern to him, as an artist; his answer, so simple, was “the only thing that matters is, is my work moving forward”. This entry was posted in Alaska, Art, Forests, Landscapes, Photography, Winter, Wrangell - St. Elias National Park and tagged spruce trees, Wrangell - St. Elias National Park on January 4, 2013 by Carl D.
This entry was posted in Alaska, Fall, Landscapes, Photos Only, Wrangell - St. Elias National Park and tagged Fall, Landscapes, Mt Sanford, Wrangell - St. Elias National Park on June 15, 2012 by Carl D.
Black and white photo of wind blown snow on a snow covered ridge, winter, Wrangell - St. Elias National Park, Alaska. Please click on the image above to view a larger version of this photo. Sometimes black and white just seems to work. And usually it’s apparent before I even set up the camera. 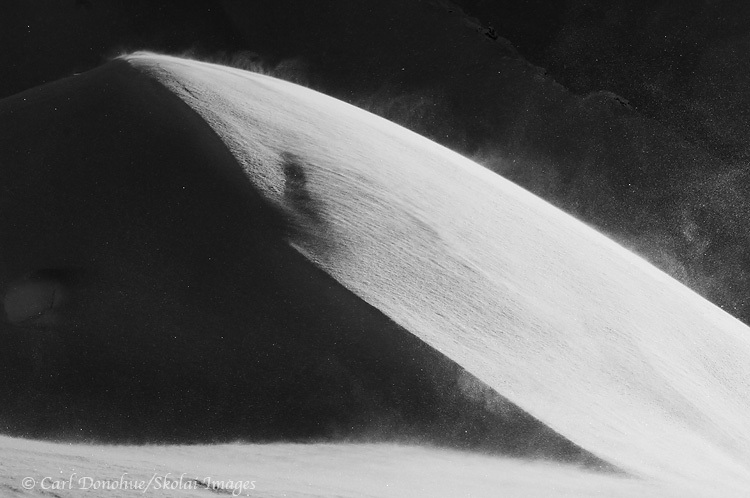 Rarely do I convert images to black and white after I’ve shot them if I hadn’t planned on doing so beforehand. 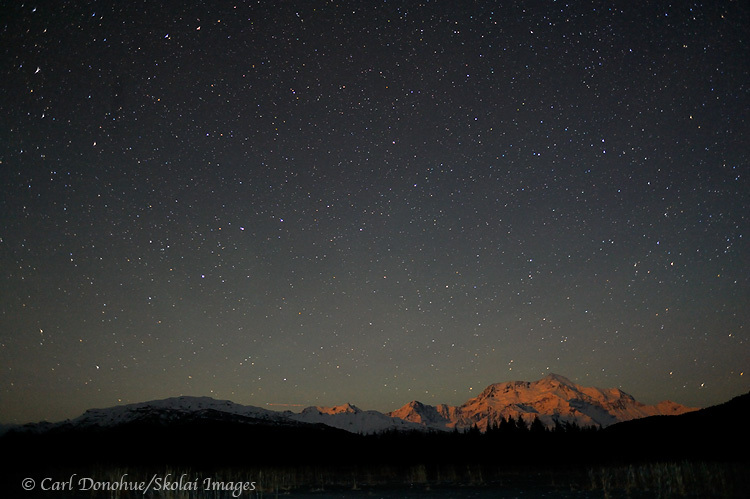 This photo I shot a few winters ago, high on a ridge in Wrangell – St. Elias National Park. 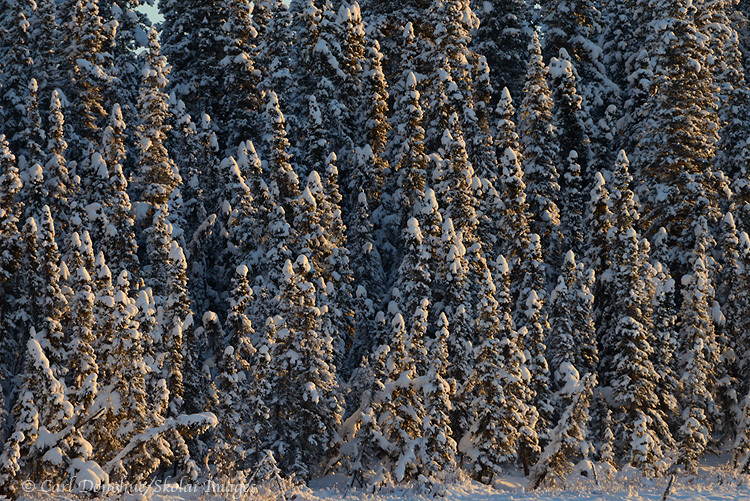 I like the backlit snow, and a slight breeze kicked up, blowing snow over the ridge. I’m looking forward to getting out and shooting a bit more over the next couple of months; this winter has seen me tied to the computer more than I hoped, but hopefully that’s almpost past and I can go shoot a little bit more. Some of these old photos from past winters have inspired me to go do it some more, and I’m looking forward to getting out soon. This entry was posted in Abstract Photos, Alaska, Landscapes, Winter, Wrangell - St. Elias National Park and tagged black and white photos, scenics, Wrangell - St. Elias National Park on February 14, 2012 by Carl D.
This entry was posted in Alaska, Fall, Landscapes, Photos Only, Wrangell - St. Elias National Park and tagged Landscapes, Mount Sanford, scenics, Wrangell - St. Elias National Park on November 21, 2011 by Carl D.
A starry night sky falls above Mt. Saint Elias, still glowing in the late evening sun. Stars at night over Mt. 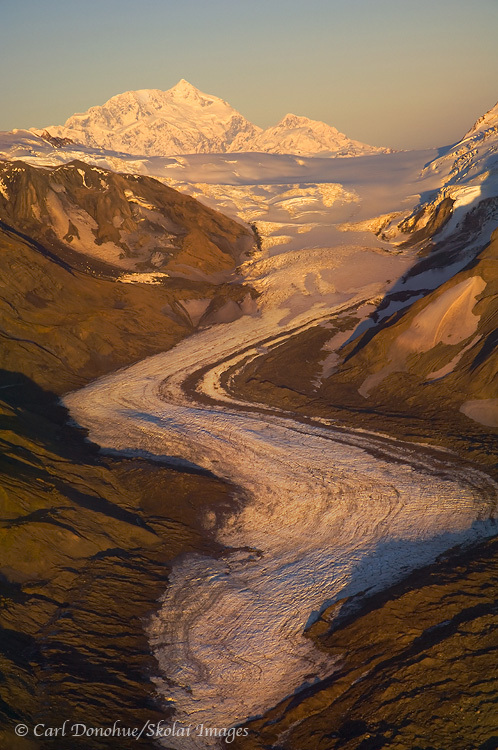 St. Elias, Icy Bay, Wrangell - St. Elias National Park and Preserve, Alaska. Sometimes the work of an artist is simply to be persistent; keep at it. Follow through on that little spark of an idea that awakens us at night; pursue that little ‘idea’, no matter how trivial, how distant it seems. That trigger is where art begins. All art. I suppose this point may be made more clearly in reverse; sometimes it’s easier to simply think ‘yeah, that would be neat’, but never actually follow up when we receive an idea. It’s always too easy to conjure up excuses not to do something, rather than actually take a single step in the direction that calls us; something akin to what they say about evil and good men doing nothing. 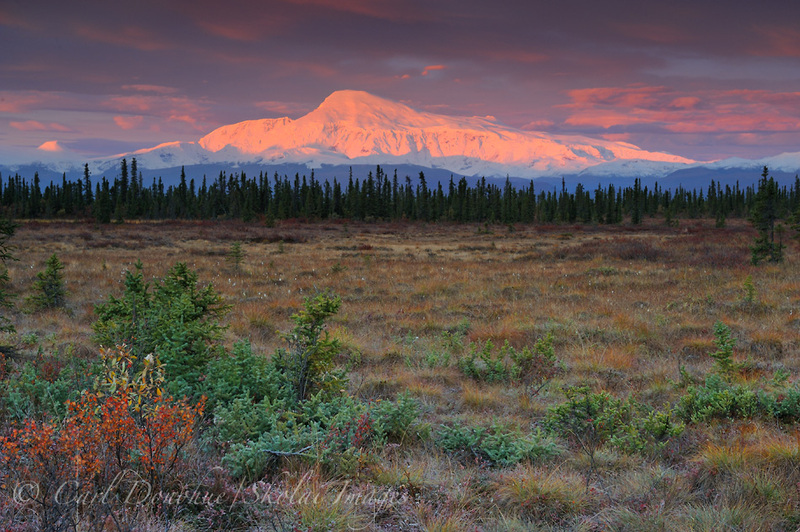 This entry was posted in Alaska, Art, Landscapes, Musings, Wrangell - St. Elias National Park and tagged Landscapes, Mt. St. Elias, scenics, Wrangell - St. Elias National Park on November 18, 2011 by Carl D.
Gilbert Point, the Hubbard Glacier and Mt Seattle, Disenchantment Bay, Wrangell – St. Elias National Park and Preserve, Alaska. Aerial photo. Please click on the image above to view a larger version of this photo. 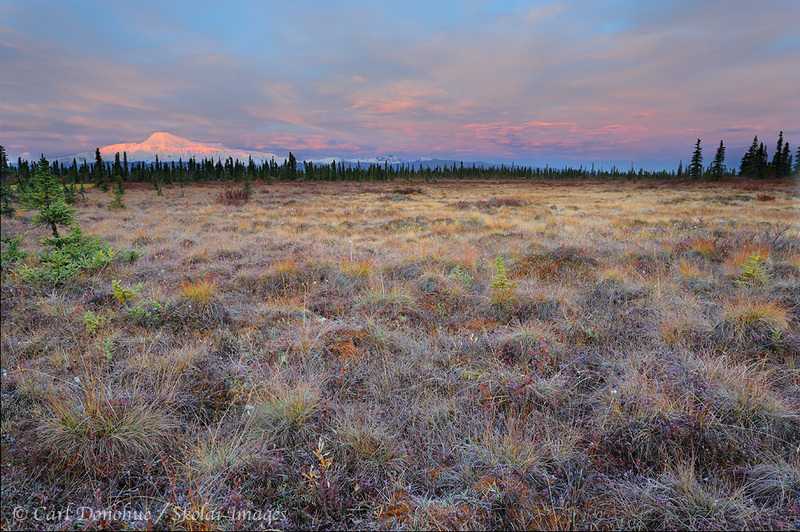 Here’s an image from the first night of my most recent trip, a month long adventure down around the coastline of Wrangell – St. Elias National Park and Preserve. 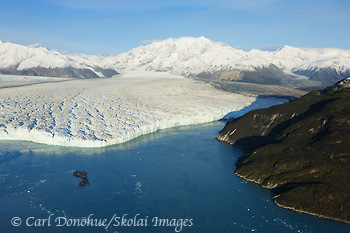 This photo was taken on the air taxi flight out to the coast; we departed a little from the scheduled route and I shot some images of the Hubbard Glacier and surrounding area. The points of interest here start with the Hubbard Glacier itself, generally regarded as the largest tidewater glacier in the world. At over 70 miles long, it’s quite a chunk of ice (given part of our trip was to look at the Malaspina Glacier and it caving into a tidal lagoon, the Hubbard’s claim to fame may be short-lived; the Malaspina is much bigger, and most definitely reaches the ocean). 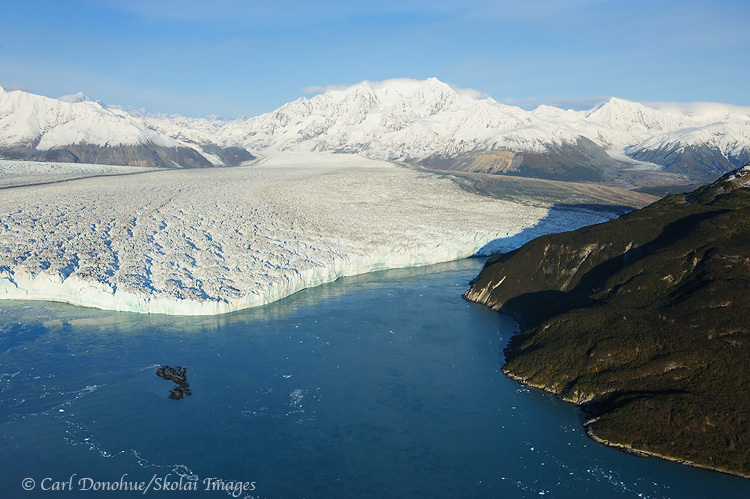 This entry was posted in Adventures, Alaska, Environmental Issues, Landscapes, Wrangell - St. Elias National Park and tagged Disenchantment Bay, Gilbert Point, Hubbard Glacier, Mt. Seattle, scenics, Wrangell - St. Elias National Park on November 9, 2011 by Carl D.
Northern lights, Wrangell - St. Elias National Park and Preserve, Alaska. Please click on the image above to view a larger version of this photo. 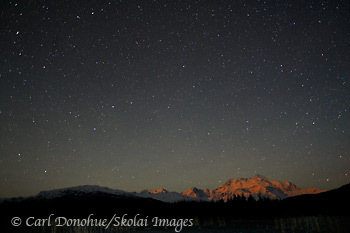 Here’s another image from a recent sojourn to Wrangell – St. Elias National Park to see and photograph the northern lights, or Aurora borealis. 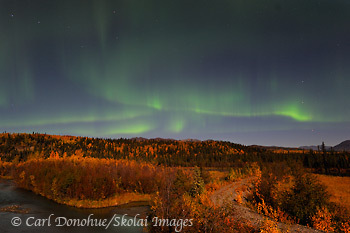 It was a treat to have a moonlit night to shoot by, providing plenty of ambient light to capture the fall colors as well as the northern lights. This entry was posted in Adventures, Alaska, Fall, Landscapes, Northern Lights, Photo Tours, Wrangell - St. Elias National Park and tagged aurora borealis, Landscapes, scenics, Wrangell - St. Elias National Park on October 19, 2011 by Carl D.